While living the dream of being married to the love of her life, having a happy family with a 4-year old child and achieving huge success in the yacht business, Aurora Winter’s life was shattered when her 33 year-old husband dropped dead beside her. She dealt with her grief proactively through self-help books, an extreme fitness regimen, and actively dating, but none of it cured her depression or relieved her foremost thought, “What’s the point?” The point was her son. He needed her. She grabbed that life-raft and developed a strategy for healing herself from overwhelming grief. Now, 20 years later, she is a successful coach and author of 3 books, including, Grief Relief in 30-Minutes. In this conversation with Dr. Nancy, she shares her story and how she shared it in her book, From Heartbreak to Happiness. She describes her first book as a roller coaster ride through emotions. But like all inspiring stories, she comes out on top. Aurora says that most people take 5 to 8 years to get over a loss, whether it’s the loss of a job, a loved one or your health through extreme illness. Even caretaking a relative with Alzheimer’s or a child with Autism causes grief. And it doesn’t have to take years to get over it. Aurora’s 9 easy steps can speed up the process and help you move on. She likens it to fixing a flat tire. It won’t fix itself and you don’t expect it to; you take action. The action Aurora recommends is to ignore the “poor me” self-talk that puts you in the victim mode and try to find something positive to drive you forward. Dr. Nancy talks about her own sadness through divorce and how she started doing things differently to go forward. She repeats one of her favorite sayings, “Yesterday is history; tomorrow is mystery and today is all we have.” Her favorite part of Aurora’s “PEACE” method, discussed in her book, is the P for living in the Present Moment. Aurora applauds Dr. Nancy for living life outloud. She encourages everyone to live in the present and embrace each moment of life. In the case of dealing with grief, she calls it an opportunity for a course correction, even a small 3-degree one, that can change your life so much that you will not end it decades later full of regrets over a life half-lived. Answering these questions will set you on the right course and help you complete the process of healing. The answer to the legacy question can show you the best way to reach out to help others by sharing what you’ve learned and actually transform your life. Aurora keeps expanding her programs. 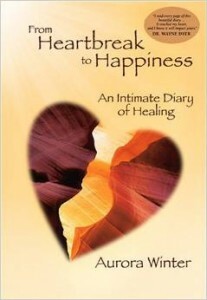 Her process in going from heartbreak to happiness can be used for going from stress to success. For herself, she is reinventing herself every decade. Both she and Dr. Nancy discuss learning, growth and reinvention as a way to live life to its fullest. To find out more, listen to this interview, visit Aurora’s websites and read her books. Whether you’ve experienced loss yourself or are trying to help a loved one, you will find the guidance you need for ending heartbreak and finding your own secret to happiness.